Living in Phoenix in the winter means we don’t have to worry about driving in the snow daily. However, snow is a short road trip away, should you be inclined to go play in it for a day or two. Winter road conditions bring hazards that many Phoenicians are not entirely familiar with, so we have come up with a short guide to help you prepare yourself and your car for the snow. Cars face more challenges in snow areas. 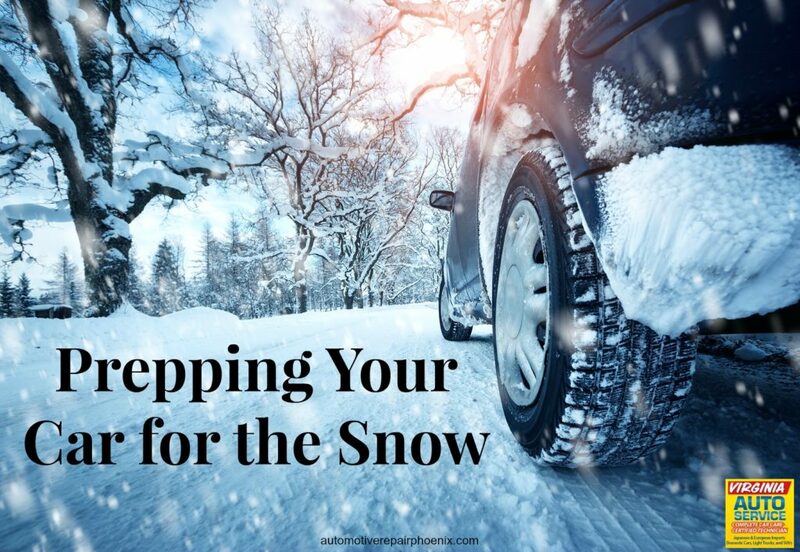 Check that your tires, wipers, lights and brakes are all in good condition. Colder temperatures are hard on a car battery. Make sure that your battery terminals are clean and the clamps are tight. If it has been three or more years since you have replaced your battery, have its charge checked, or consider replacing it. It is better to pay for a new battery before you go than to end up stranded with a dead one in the snow. Make sure that you have jumper cables in your vehicle, in case your vehicle struggles with the cold. Check your coolant levels. Another name for coolant is anti-freeze. Its purpose is to increase the temperature to boiling which allows our cars to handle the hot weather and more importantly for a snow trip, it prevents the engine from freezing. Make sure the coolant is the proper mixture to cope with the temperatures you will be in. You can refer to your owner’s manual, or talk with one of our trusted mechanics for more details. Check that your wiper blades are in good condition and that your washer fluid is full. Consider using a solution that is made for colder climates so it doesn’t freeze on you. As a rule, you should try and avoid letting your tank drop below a quarter full at all times. It is better for your engine and ensures you won’t run out of gas. However, in cold weather, the fuller the tank the better. If you end up on the side of the road you can keep your car running longer for warmth if you have enough gas. Chains for your tires can be a lifesaver in the snow. Before you head up, consider buying a set. Before you go, make sure you learn how to use them so that you aren’t struggling to figure it out in the cold snow. Keep your basic emergency kit, but add to it for cold, snowy conditions. In winter, add extra warm clothing like jackets, hats, and gloves, a shovel, kitty litter or sand, an ice scraper, blankets, etc. in case of a breakdown. For more information on driving safely in the snow read our blog How to Be Prepared to Drive in the Snow. Virginia Auto Service loves to help you with your vehicle in any way we can. If you need help preparing your car for a trip to the snow, give us a try. Call (602) 266-0200 or schedule an appointment online.